I just love seeing my children smile. 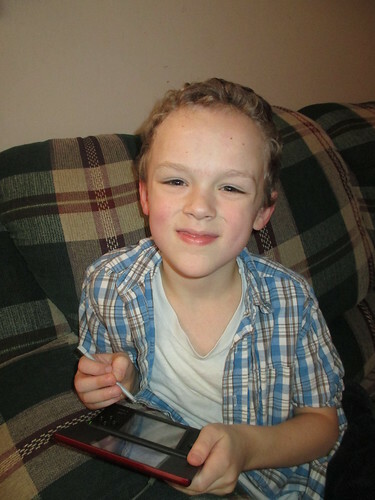 This was a good smile from Timothy. Usually he's too busy or concentrating too hard... but this time, he smiled for me. Love this boy of mine! 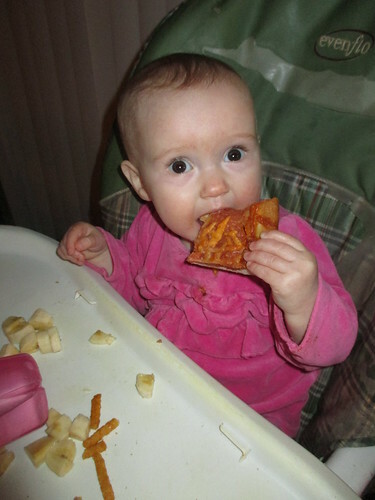 This little girl LOVES pizza... probably because her family does and she wants to have what everyone else has! It's good to see her eat. 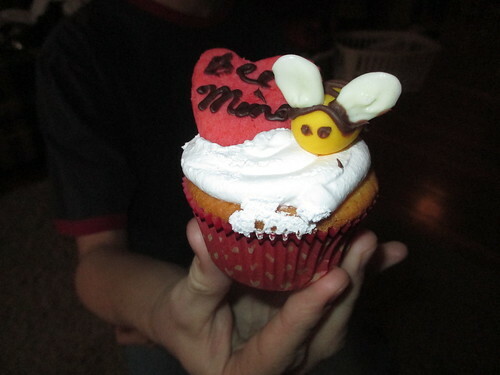 A friend at Relief Society made these cute cupcakes and sent some extras home with me for my family. Aren't they cute? Friendship brings me joy. The kids loved the little bees. Timothy loves Green Lantern. 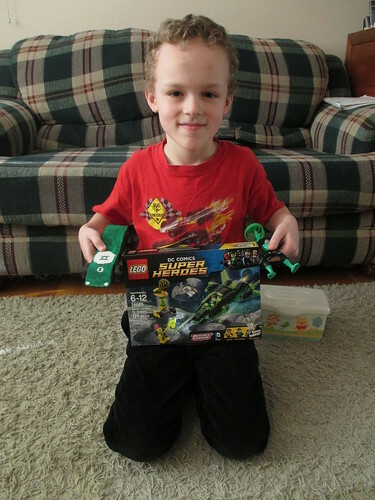 He used some of his Christmas money to buy a Lego set. He is also showing off a toy he's had for a while plus his Pinewood Derby car. I love when he gets really excited about sharing what he loves! Today is a big milestone! I've known Tom for exactly half my life. I think that's amazing. It just gets better from here on out. 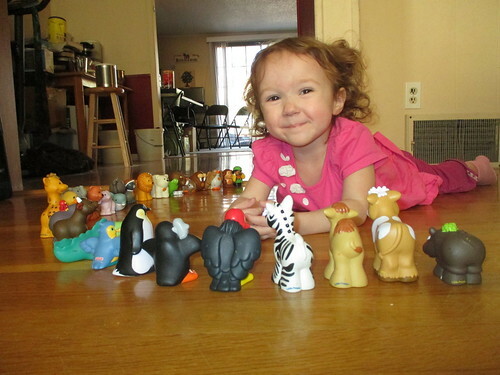 Line up all the Little People animals and smile? 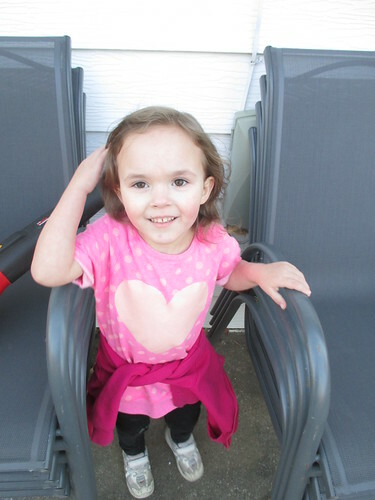 I know there's a lot of Juliana this week, but we were all so sick for so long and especially my little girls, that it's so fun to see her playing, active, having fun, and being herself again that I just can't help but find joy. Here she is being a baby T-rex. There is absolutely NO resemblance between my sweet little 2 year old and a carnivorous dinosaur from millions of years ago, but she thinks that pulling her arms in tight and making her face like this, she is being a baby Tyrannosaurus Rex. Her cup is full of meat chocolate milk and the measuring cup is full of meat cereal (for a snack after church). Because baby T-rex likes meat. And the look on her face. I love that she includes me in her pretends. Because I'm the Mom T-rex. 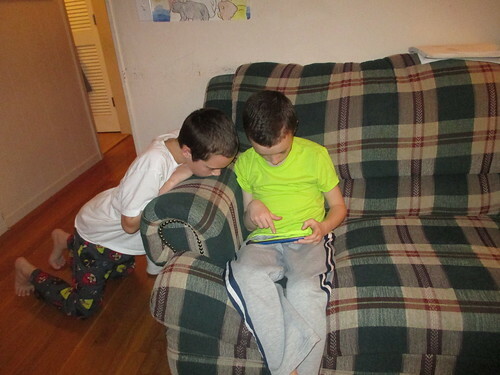 Brotherly togetherness... yes, playing a game and that's their whole focus, but I love seeing them together. Finding something they both love. Again. One of the joys of having a large family is moments like this... moments of connections between siblings that I can't create or force... but happen anyway and make me remember why I'm so happy with my large family. 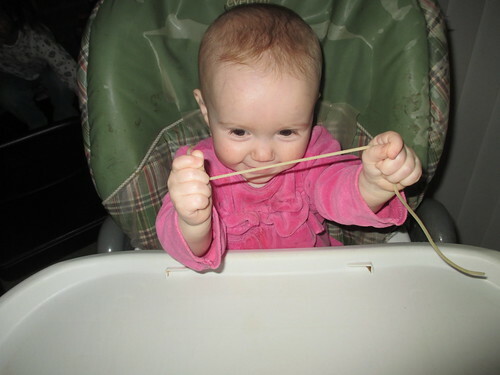 Ginny playing with spaghetti... love the happy look on her face! Juliana had her first visit to the dentist today. While she didn't completely comply cooperatively, she did great and opened her mouth and they were able to look at her teeth and all is well. 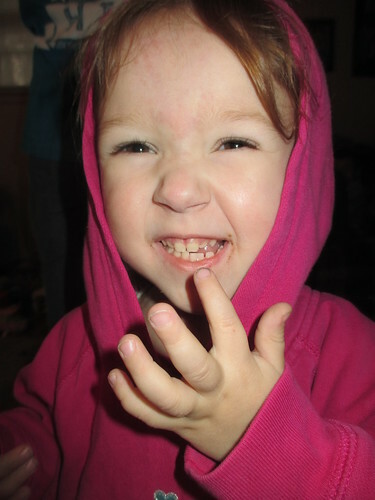 Here she is showing us her teeth. She thinks she's soooo big. But she's a happy girl. As of right now, other than a few lingering coughs, we're all healthy. 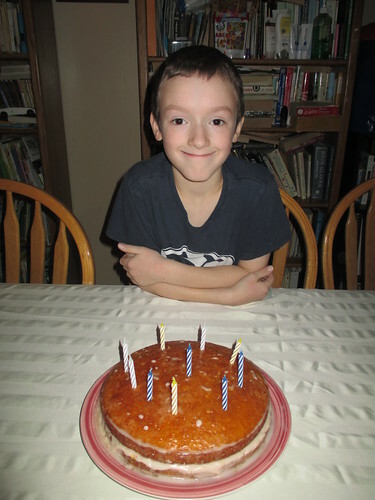 Samuel turned 10 today! Happy Birthday to our almost Punxsutawney PA baby boy. Instead he's our first Texan. Big 2 digits. 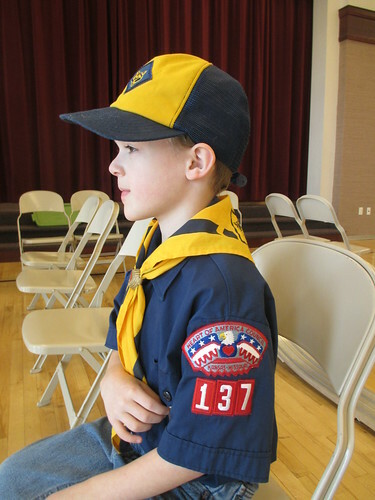 Webelos Scouts. We love birthdays! We love our family celebrations. Virginia with her happy grin. Big toothy grin! Amidst all the illness, she's also gotten her 5th, 6th, 7th, and 8th tooth. 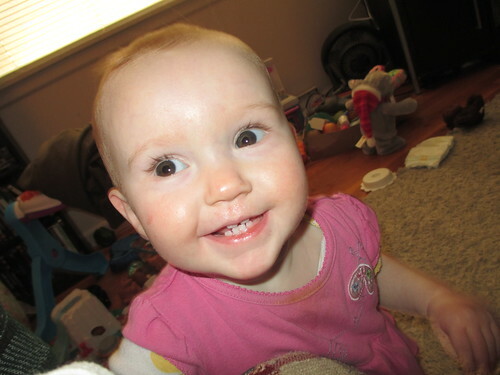 Joy in the morning when the teething is... improving. 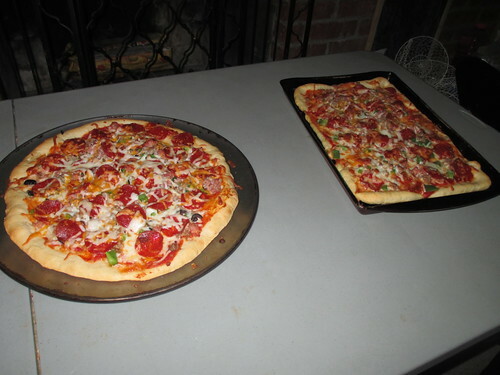 Oh, and Pizza. Just because. 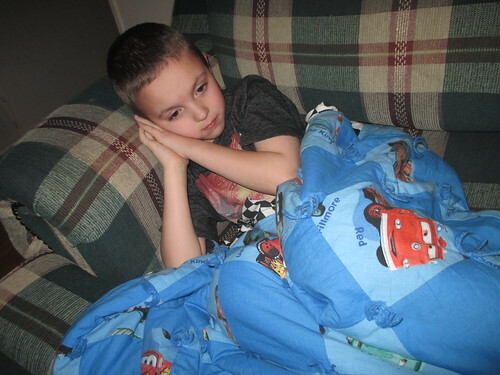 Timothy watching his Pinewood Derby race... he's worked so hard and was so excited to participate! 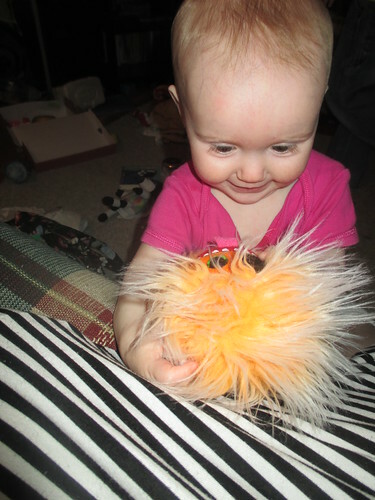 Ginny with the fuzzy toy monster Timothy got her for Christmas. It has been warm outside and here is Liberty playing outside, happily! Emilie and Ginny sharing a smile. Timothy knows the presidents better than I do. Thanks to President flash cards, President puzzle, President place mat, and now a President workbook I found in the dollar section at Target. I am so happy he loves to learn! Michael is reading Shakespeare. Hamlet, to be exact. 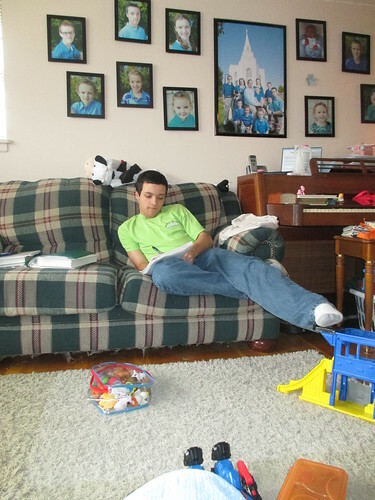 He is completing a list he compiled of books that he should read before he graduates from homeschooling. Not that he'll stop reading, but stuff that's on his list to do soon. Ginny loves books. Any books. Michael was holding a book. OF COURSE the book was for her to read, too, and she wouldn't take no for an answer. So Ginny reads Shakespeare, too. I think she skipped Hamlet for King Lear, though. My poor tired little girl... so tired. So sick. I am thankful that being sick allows us to appreciate being healthy! 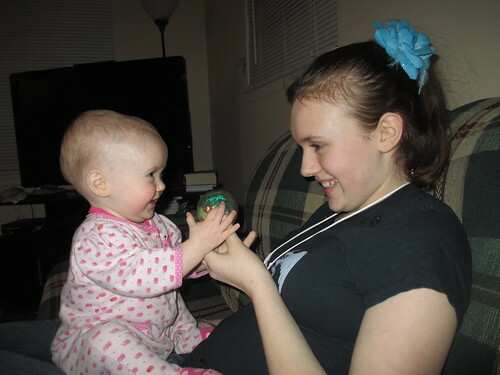 This little girl prays every night that she and her sister and her family can feel better. That brings me joy. Not her being sick. 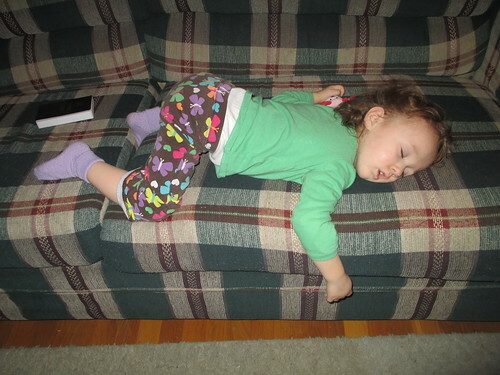 So sick she falls over and falls asleep. 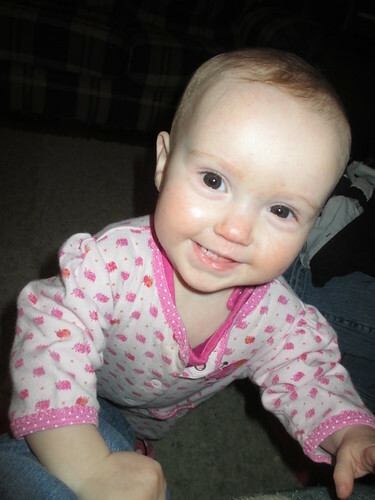 This little face couldn't possibly have gotten into any trouble. At all. This little grin brings me joy every day! I love that she's happy even when she doesn't feel well. Juliana reading her fairy tale stories retold using Plants Vs. Zombies... one of her favorite Christmas presents. 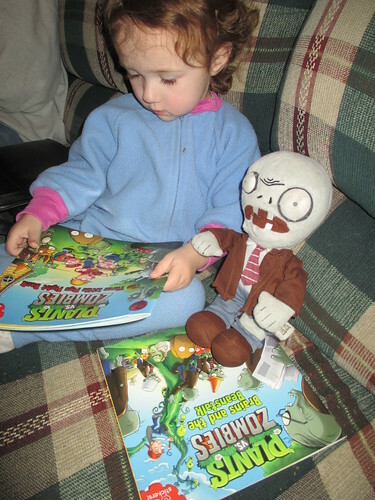 And yes, she's reading them to her zombie friend. This makes me happy... she's not really reading yet but even better that she wants to, and that she has books about her favorite things. Michael spent the first weekend of the New Year on a "Mini Mission", living as a missionary in every way 24/7 for 3 days. This weekend he just spent a few hours with them, teaching the gospel when he could. It brings me joy that this is in his future, as well. 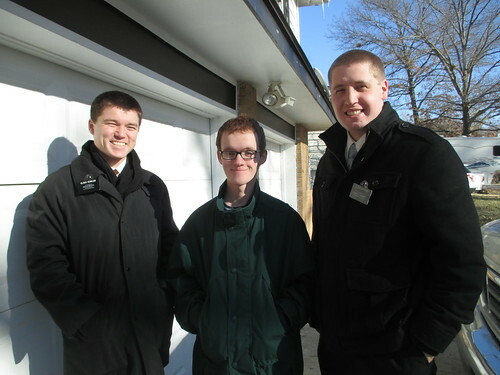 He is preparing to serve a mission full time, for 2 years, as the Lord asks him to do. He's not ready yet, but he will be. Here is a true indication of how sick Ginny is. She is NOT well at all right now. However, she is not wheezing, she is not dehydrated, her cough is intermittent, she is still eating a little and drinking enough, she has moments of fun... so I am not TOO worried. We are not hospital bound. Yet. On the other hand, I see this sad, listless, sick little face and I just want to make her better. I am happy that most likely, she will be, soon. And her body will be that much stronger for going through this. 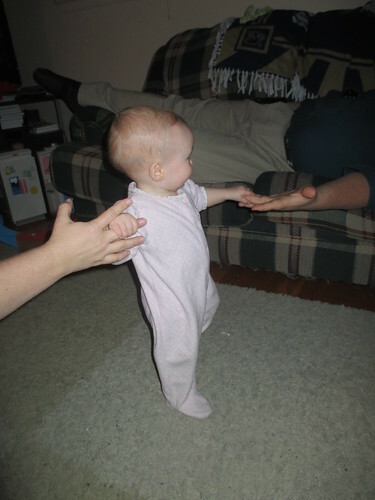 Someone is trying to walk. 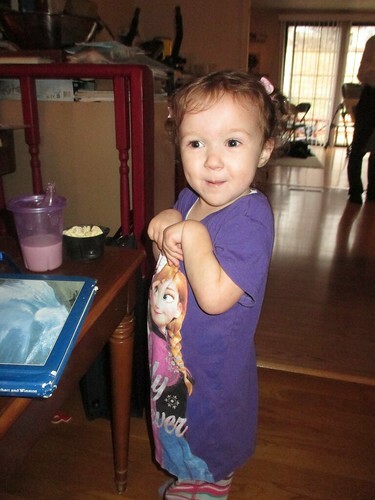 I just loved this picture that as she's letting go of my hand, she's holding on to Dad's... and crossing the room safely. 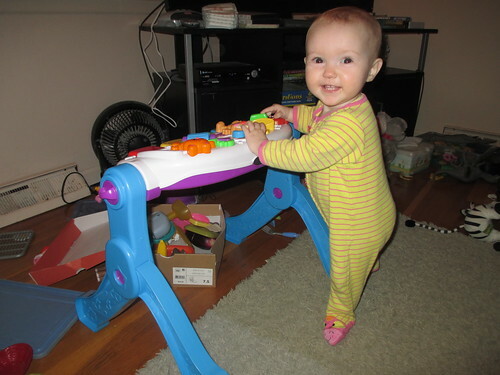 She's 11 months old, very sick right now, but at times feeling well enough to try this new skill. She also has 7, going on 8, teeth. Crazy busy, this girl is! Joy! 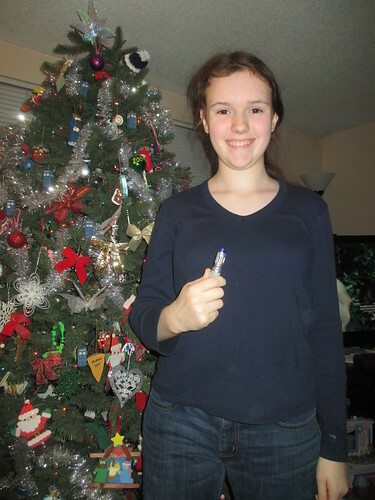 Emilie bought a Doctor Who sonic screwdriver and she was pretty thrilled about it. This daughter of mine makes me proud... and happy. She does love fun and interesting things. Yes, the Christmas tree is still up. We do leave it up for at least 12 days after Christmas. We just always have, and I love the reminder of the beautiful season. 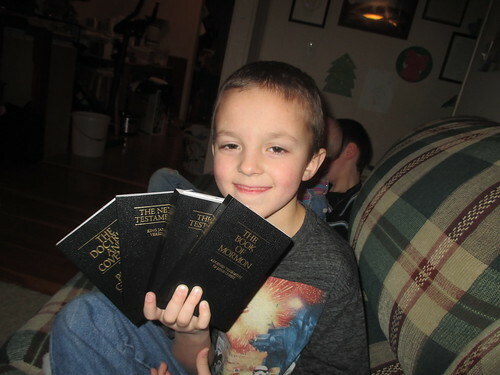 My younger readers didn't have their own sets of scriptures yet (they each had a Book of Mormon for daily study but not anything else...) so when there was a sale on pocket sized sets of scriptures, we bought enough for them each to have all of them! We believe in the Bible alongside the Book of Mormon as testaments of Jesus Christ. We also have a book of revelations called the Doctrine and Covenants. They are so thrilled to have their own! (and no, Jules isn't reading yet but she was excited, too.) These pocket sized books are a set of 4, including the Book of Mormon, the New Testament, the Old Testament, and a Doctrine and Covenants and Pearl of Great Price. 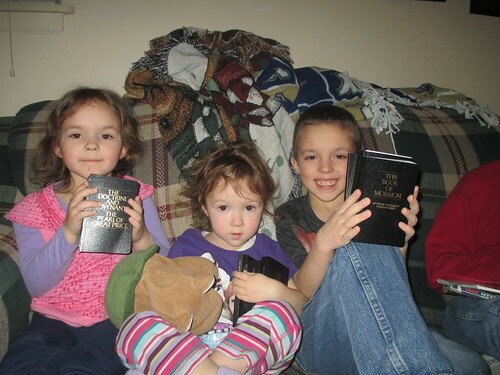 They're all ready for all family scripture studies! We just studied the Old Testament as a family last year, and this year we are studying the New Testament. 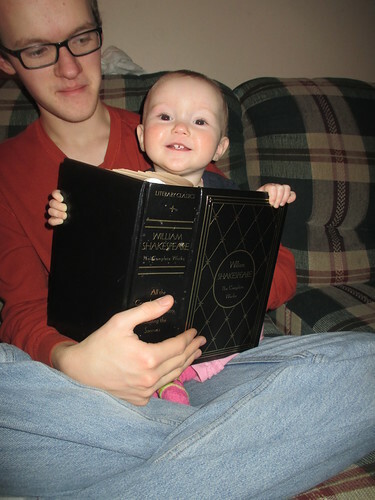 It brings me joy that my children want to study the scriptures as a family. Today I am thankful for our warm home. 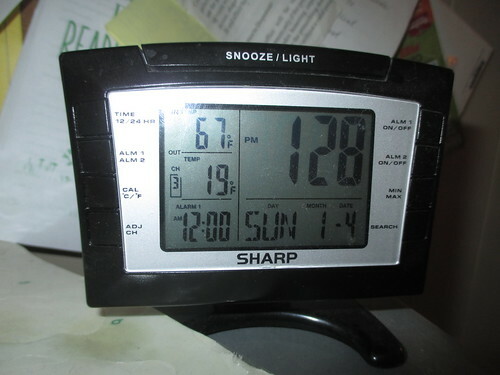 I am posting a picture of how cold it is outside... but you can also see how we have warmth inside! This is reason to be joyful! One of my children is out in the cold today, for a good reason, and I pray he stays warm. I'll write more about that later. Another reason for joy. This is one of my favorite Christmas gifts. I collect Nativities. It didn't start out that way. My sister or parents gave me a Nativity early in our marriage and it was a cute little one with small children as the people in the scene. It's been very well loved and a few of the pieces are chipped and scratched, but they've held up very well! 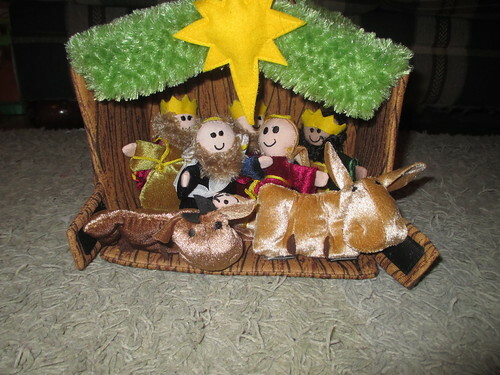 I bought a second one the first year Fisher Price made a Little People nativity. (the non noisy one!) Since then, as I've found more and been given more of these precious Christmas decorations (and reminders), I've seen a theme... they are all child oriented. So it is my favorite collection... my child-themed Nativity sets. They bring me joy each year. I'll have to post pictures of the others as I put them away, but here is the one Tom gave me for Christmas this year. The pieces velcro to the stable, so some of the kids (and I) have put the donkey and the cow on the walls or roof and called them spidercow, spider donkey, etc. All in fun. Another fun addition. We're fighting a lot of illness in our home. 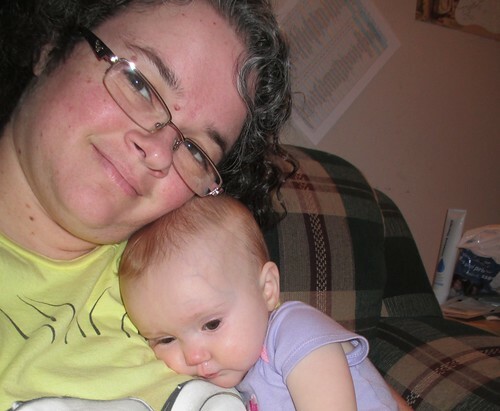 Jules and Ginny had croup most of November and December. Right now we're all fighting a nasty cold. It's just knocked us all onto our bums. We are just hunkered down and staying home, while trying to keep the household running. As there usually is someone well enough to keep things running, it's going well. This is Christopher at one of the worst moments. He took a lot of naps, and this was one of the times he was awake and wanted to be with the rest of the family. So what is joyful about this? We know everyone will recover. We have good moments. Life is still good while sick. We can still read together, play games together, and pray together... for good health, if nothing else! That is joy. To hear the faith in my littlest's voices as they pray for everyone to stop coughing and sleep well. It's a new year! I've been doing daily pictures of our life here in Missouri now for 4 years... and it's on to a new one. One thought... we've lived in this home longer than we've lived anywhere else now... I know we were in Texas longer, but we bought a house after 2 years. This has been our home the longest. And just like everywhere else, we've had our ups and downs here. However, we don't have to focus on the downs. So this year, the pictures may not be of the happiest parts of our days... but they are joyful. Have a Joyful 2015 with us! And I freely admit, I don't always take a picture every day, but I do try to make up for it by remembering something from the day before and keeping it real! We love puzzles! Here is the one we are working on right now. It brings me joy to have activities my children enjoy with me, and building something out of chaos also brings me joy. Enjoy a puzzle! 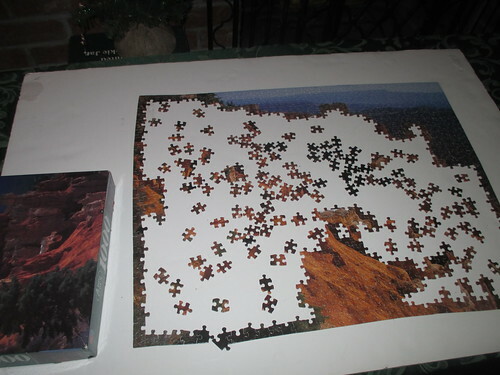 Winter often brings illness, which seems conducive to my family wanting to do puzzles, along with the colder weather where we don't want to spend a lot of time outside. Here's a blog post I did on puzzles just this past month, for the Happy Housewife. 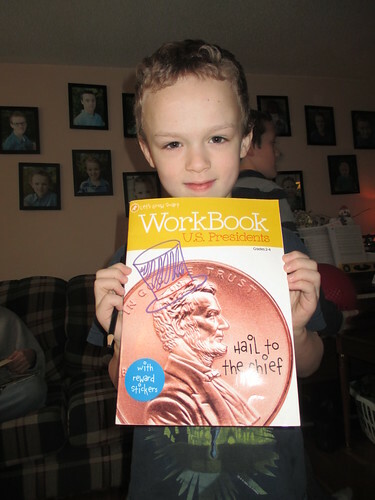 I've been a contributor on this site about as long as I've been doing daily posts on VFHomeschool... and that also brings me joy.